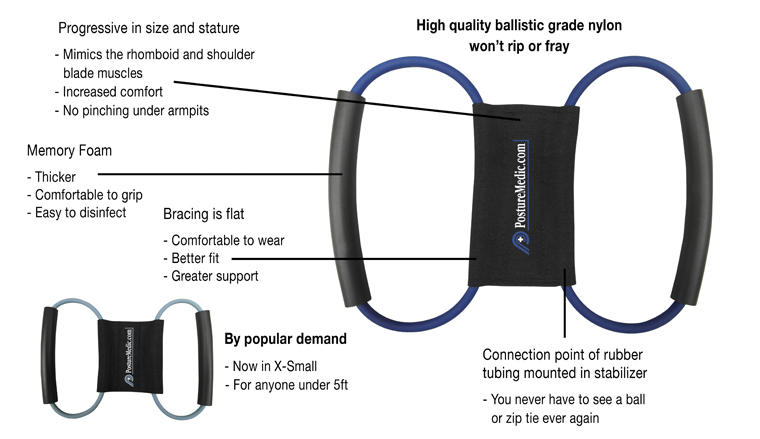 The Posture Medic is a resistance band that “reminds” the body to stretch, strengthen and stabilise the back muscles providing you with better posture. By using the Posture Medic with our recommended exercises and stretches, it’s simple for you to reduce pain, pressure and discomfort caused by injury from poor posture. This will help improve your life as you’ll have more movement and will be able to carry out more tasks without pain. By following our 6 week program you will learn how to stretch and release the pressure from those tight muscles in your back, neck and chest allowing you to straighten your back and enjoy thebenefits of good posture. Our strengthening exercises are designed to focus on the neck and back muscles which are often disregarded when we exercise and are not used to their full potential. The Posture Medic helps to hold your shoulders up and further back so that your entire core is straighter. Many of us slouch or hunch without realising and this ends up compressing the spine which leads to a tighter chest and neck and a weaker upper back. This poor posture not only gives off a negative impression to other people, it also causes aches and pains.By wearing the Posture Medic it helps you to kick the habit of slouching without giving it a thought and soon you’ll be standing and sitting tall without even having to think twice!